Kailey Lawson ’17 studies a disorder most people shy away from—psychopathy. 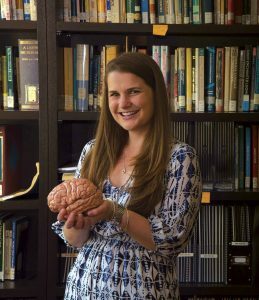 FOR THE PUBLIC, the term “psychopath” is almost interchangeable with “serial killer,” but Kailey Lawson ’17 believes most people with the personality disorder get a bad rap, and she wants to devote much of her future work in the field of cognitive science to understanding why they think and act the way they do. And that starts, she believes, with trying to understand them instead of demonizing them. From an early age, spurn fiction for nonfiction. Fall in love with true-crime books because of your interest in human motives. Aspire to be a criminal profiler until you learn that your image of a profiler is a TV fiction, not a real job. In high school, follow your mother’s example and get involved in community service, volunteering at a food bank and local homeless shelter. Fall in love with the work partially because you find it fulfilling and have a deep interest in understanding the problems of the people you’re helping. Know that you don’t want to follow in your brother Nick’s footsteps at Pomona College, but end up deciding it’s the best place for you anyway. And though you’ve always thought philosophy was abstract and boring, take a first-year seminar with Professor Julie Tannenbaum in medical ethics and discover that the field deals with intriguing real-world challenges. Love your class in forensic psychology with Claremont McKenna College Professor Daniel Krauss so much that you end up as his research assistant. Major in both philosophy and cognitive science because you see them as two ways of understanding human behavior; then spend a summer with Harvard’s Mind/ Brain/Behavior program in Trento, Italy. Inspired by a lecture by author/activist Bryan Stevenson on mass incarceration, follow his advice about getting “proximate” to the problem. Spend a summer working behind barbed wire at Patton State Hospital, a psychiatric facility in the California correctional system. While there, take an interest in psychopathy, which you come to believe is misunderstood. As a senior, write two theses on the subject of psychopathy—an examination of the ethical theory of the blameworthiness of psychopaths for your philosophy major, and a study of inhibition deficits in high-functioning psychopaths for your “cog-sci” major. Conclude that psychopathic traits should be treated as a mitigating factor in both moral and legal domains, and decide you want to study the subject further to be able to influence public policy. Gain admission to a top Ph.D. psychology program at UC Davis with a professor whose research offers opportunities to pursue your chosen work into the future.